How you heat your water is one of the biggest decisions for energy efficiency. Water heating is one of the biggest contributors to your energy usage and costs. So, although the solar thermal heater is not really a mechanical system (gravity delivery and pressure fed) I can't emphasize it enough. We plumbed in an on-demand or "flash" gas water heater downstream of solar thermal heater. It has a mixer valve to heat up or cool down the water as necessary. It is very quiet and efficient - computer controlled ignition, burning and saftey. We used cross-linked polyethylene tubing (PEX) instead of copper. Why ? The choice was difficult when weighing the environmental, health, sustainability and costs. Read about it at Wikipedia and then consider the proc/cons of copper. The PEX tubing used a manifold system near every delivery point. My plumber actually used copper for the actual stub out to sinks, tubs, etc. to make a more rigid connection. 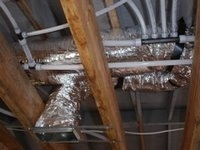 The PEX tubing makes for a very quiet plumbing system! After desiging a dual-plumbed boiler system more DHW and space heating, modifying that to a fan-coil based system I finally realized that it didn't make sense to pour a lot of money into my heating system when my goal was to not have to use it. Plus, I wasn't comfortable with the complexity and costs of the design. 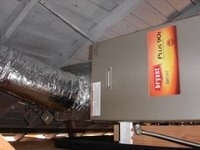 Instead we specified the smallest furnace possible. We used a Bryant 2-stage 93% efficient Energy Star system that is wonderfully quiet and only needs comes on in the low stage which provides a gentle warming of the house. 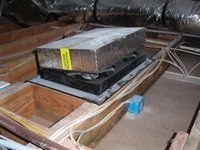 The building envelope does the rest to hold the heat in for a long time. We added a whole house fan in the centrally-located hallway. It has a lot of RPM's, dual fans and an R-22 automatically opearated lid. It was quite exciting turning it on the first time. Its called a Whisper something or other and it is quiet when it gets up to speed but, I love to turn it on for its affect ...With the windows cracked you can quickly exhaust the hot air out of the house as you draw cool air in.